After improving in 2012, the overall health of Roberts Bay shows a downward trend in 2013, with a noticeable increase in the metrics for nutrient pollution during the latter half of the year. Heavy rainfall during the late summer/early fall may have been a contributing factor. Phosphorus levels remain well below the target value, but nitrogen and chlorophyll show an upward trend and were above target levels, though below thresholds. Water Quality: All three water quality indicators (chlorophyll a, nitrogen, and phosphorus) were rated as pass (below the threshold). However the mean values for all three water quality metrics were higher than the previous year. The mean for chlorophyll a was calculated as an arithmetic mean and the means for nitrogen and phosphorus were calculated as geometric means (per the Numeric Nutrient Criteria outlined in the Florida Administrative Code, section 62-302.532). The score for both chlorophyll a and nitrogen declined from “Excellent” to “Good”, as their mean values in 2013 were not below targets. Mean Chlorophyll a concentration (0.0101 mg/l) was above its target value of 0.0082 mg/l, but below the threshold level of 0.011 mg/l. Similarly, mean nitrogen concentration was 0.5142 mg/l, between its target and threshold values of 0.450 mg/l and 0.5406 mg/l, respectively. Although the mean value for phosphorus increased somewhat (to 0.0989 mg/l), it is still well below its target value of 0.190 mg/l, so it retains its score of “Excellent” from the previous year. 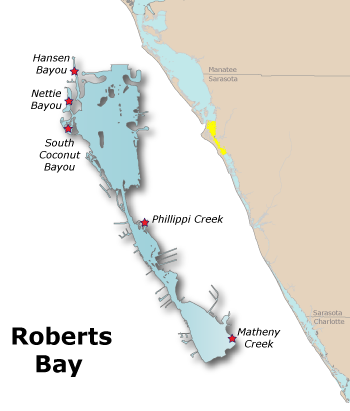 Biotic Indicator: Measurement of the biotic indicator, seagrass, is performed at two-year intervals and is due for monitoring again in 2014. While total seagrass acreage in Roberts Bay shows an increasing trend, the 2012 acreage of 300 acres is still slightly below the target value of 348 acres.